Our easy to use Content Management System puts you in control of merchant directories, interactive maps, event calendars, itineraries, as well as traditional website features like posts and image galleries. Citylight is specifically designed for use by non-technical users. 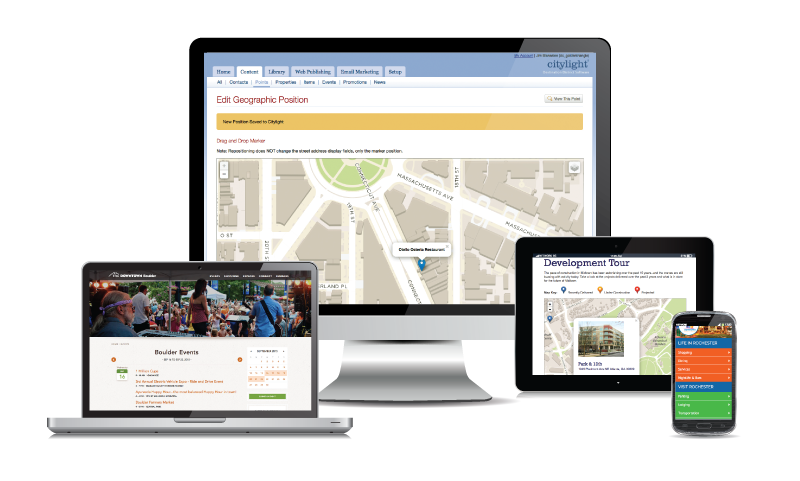 With powerful features and a long history of satisfied clients, Citylight is the leading platform for destination district marketing and data management. How do you celebrate and promote your destination district? Citylight enables your organization to publish a sophisticated and functional website. And it's so easy to use. More than 40 downtown district organizations manage their web marketing with Citylight. Citylight understands your content geographically. As a result, we are able to add location aware web features such as interactive maps, "what's nearby," and "find the nearest" for your directory and events calendar. Provide a categorized and searchable directory that allows residents and visitors to discover local venues. Display your attractions on beautiful, fast, custom branded interactive maps. Give visitors relevant and timely content with searchable events calendars that are always up to date. From happy hours to boutique sales, promote your local businesses with accurate and timely content. Tell the story of your destination with image driven blogs that connect to your merchant listings. Offer curated experiences through hand craft narrative and map content via tours and itineraries. Easily manage Open Graph settings for social sharing across platforms like Facebook and Twitter. Immediately publish sitewide alerts such as event cancellations or important emergency announcements. Citylight 8 adds new CRM functions like property tracking, enhanced contact management, member management, and integrated HTML email marketing.